Palliser Home Theater seating is a contemporary line of home theater seating. You can choose from several new home theater styles of seating with options to order bass shakers, wireless bass shakers, LED lighting, tray tables and power recline. 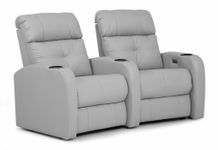 We have added many new home theater seating styles some of which have standard lighted cupholders and lighted base. The Rhumba, Elite, and HiFi are some of the more popular styles. We feature microfiber and leather covers in a variety of colors and grades. For a custom home theater seating quote, contact us at 888-764-9273. Get to know Palliser home theater seating through this insightful video by HTmarket.com, which shows how you can customize your theater seating with cutting-edge features like power recline and LED lighting. Check out the Palliser Elite in action. Fasten your seat belts for a great ride. The Elite is a classic style with many options. Great styling and comfort. Very unique.